Critical End! 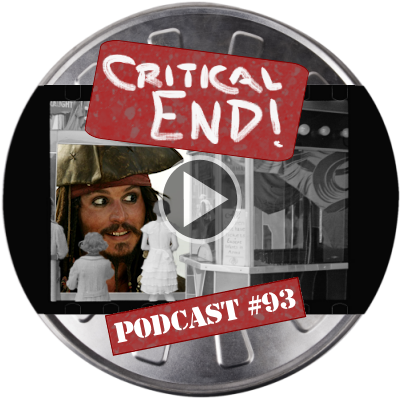 (The Podcast) #93: In-Depp | Critical End! REVIEWED: Pirates of the Caribbean: The Curse of the Black Pearl, Pirates of the Caribbean: Dead Man’s Chest, Pirates of the Caribbean: At World’s End, Pirates of the Caribbean: On Stranger Tides. Sorry, but after nine and a half hours of pirate movies, I have no witty comment for this description. This entry was posted on Friday, May 27th, 2011 at 6:39 amand is filed under . You can follow any responses to this entry through the RSS 2.0 feed. Both comments and pings are currently closed. I feel the need to point out that Pirates of the Caribbean is a Disneyworld ride, not Disneyland as indicated in this podcast. Actually it’s at both parks, but as I learned from the special features on the second disc of Pirates 1, it was at Disneyland first. I say you’re both wrong.